When a pet’s nails become too long they interfere with their mobility. Untrimmed nails can also split resulting in a great deal of pain, bleeding, and a trip to the veterinarian’s office. In severe cases nails can curl under and grow back into a pet’s paw causing a very serious and painful infection. The quick is the living part of a pet’s nail and has blood vessels running throughout. Cutting into the quick during nail trimming is painful for your pet and will result in bleeding. Using the QuickFinder®, will set your mind at ease because our lighting system will ensure that you will know where the quick is! Another important fact to note is that the quick grows with the nail. As pet’s nails grow longer the quick will also lengthen. So if your pet’s nails are overgrown you will not be able to clip the nails to the desired length without cutting into the quick. You will need to trim the tips of your dog’s nails often, and over time the quick will shorten. Splitting, breaking, and ingrown nail problems are very common on the dewclaws. We've seen them grow around into a complete doughnut. Worse, we've seen them grow right into the dog's leg, causing pain and abscesses. The dewclaws are the nails located on the inside of the leg just above the paw. If your pet has them remember to include them in your pet nail trimming routine. These nails don’t touch the ground, so they don’t wear down as fast as the others as your dog walks on rough surfaces. Trimming your pet’s nails regularly will easily prevent these problems. When should I trim my pet’s nails? One indication that your pet’s nails need a trim is when they begin to curve. And if you hear a clicking or tapping sound as your pet walks across a bare floor it’s definitely time for a nail trimming. But it is best not to wait that long - once or twice a month is usually a good rule of thumb for nail trimming. To make this regular grooming habit less stressful, familiarize yourself with your pet’s feet. Hold them and touch them regularly so that your pet is comfortable with you touching their feet and nails. Most pets are sensitive in that region. Grabbing and holding tightly to the foot is objectionable and painful - much like someone grabbing your hand like a handshake and then squeezing your knuckles together. It is best to grasp the leg firmly at the first joint instead of just the foot. Gently rub the feet, spread the toes, look at the nails but don't clip the nails at first. Then familiarize your pet with the clippers. Let him see them, smell them, rub his body with them and touch his feet with them. If you are careful with your clippers or if you use the QuickFinder® safety clippers he should never experience pain. These procedures are even more important if your pet has had the quick cut before and is already frightened by the job. Have patience. Work slowly and frequently without pain. 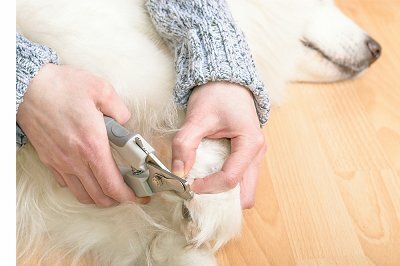 Trimming your pet’s nails is one of the regular home grooming tasks that helps to keep your pet healthy and active. As with most grooming tasks, rewarding your pet for positive behavior is an important part in your pet’s acceptance of the activity. It’s always best when your pet can associate the attention you lavish on him or her with a positive, happy memory. Learning the tricks to proper nail trimming, training your pet with positive feedback, and showing patience and love will make the time you spend together a reward in itself. Practice will make it much easier.